We supply a full range of jointed glassware including the leading brands Quickfit, Pyrex and Duran. We can guide you through the ordering process and help you to select the right pieces of glassware to suit your requirements. We supply a variety of socket sizes and cone sizes and we can match your existing equipment. All Quickfit equipment complies with ISO4800 and is manufactured from borosilicate glass reducing chemical attack and thermal shock. We supply a full range a full range of stoppers, stopcocks and other equipment to use with our products. If a standard component is not suitable for you, our customised glassware department can make a glass component to fit your exact requirements including the correct sized joint to fit your existing glassware. 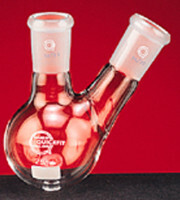 We can also repair and maintain your glassware.